Lipid genetics: Is this a worthy cause? The genetic basis for most of the rare lipid monogenic disorders have been elucidated, but the challenge remains in determining the combination of genes that contribute to the genetic variability in lipid levels in the general population; this has been estimated to be in the range of 40-60 per cent of the total variability. Therefore, the effect of common polymorphisms on lipid phenotypes will be greatly modulated by gene-gene and gene-environment interactions. This approach can also be used to characterise the individuality of the response to lipid-lowering therapies, whether using drugs (pharmacogenetics) or dietary interventions (nutrigenetics). In this regard, multiple studies have already described significant interactions between candidate genes for lipid and drug metabolism that modulate therapeutic response--although the outcomes of these studies have been controversial and call for more rigorous experimental design and analytical approaches. Once solid evidence about the predictive value of genetic panels is obtained, risk and therapeutic algorithms can begin to be generated that should provide an accurate measure of genetic predisposition, as well as targeted behavioural modifications or drugs of choice and personalised dosages of these drugs. Current knowledge about the genetic basis of lipid diseases has its roots in the 1950s, with the development of techniques to separate and quantitate different plasma lipoprotein classes. The lipid field experienced a definite boost during the 1960s and 1970s with the enhanced capacity to carry out more extensive phenotyping. This contributed to the first classification of hyperlipidaemias by Fredrickson. The work also led to the recognition of the familial basis for some other rare disorders such as abetalipoproteinaemia, which is characterised by the absence in plasma of the 'B' protein of beta-lipoproteins, and its mirror image, Tangier disease, characterised by the almost complete absence of 'A' apo-protein from alpha-lipoproteins in the plasma . During the ensuing years, the molecular bases for some of the rare, monogenic disorders have been uncovered. It is apparent, for example, that hyperlipoproteinaemia type IIa is, for the most part, the result of mutations at the low-density lipo-protein receptor (LDLR) gene; in fact, it is now known that there are over 700 such mutations . Similarly, type III hyperlipoproteinaemia was found to be associated with specific apolipoprotein E (APOE) alleles plus some other poorly characterised trigger(s). Hyperlipoproteinaemia type I was found to be the result of mutations at either of two genes: lipoprotein lipase (LPL) or apolipoprotein C-II (APOC2). One of the most interesting stories about the genetics of lipids is represented by the race to understand the molecular basis of Tangier disease. This was a marathon pursuit that ended up with three groups reporting simultaneously the finding of the ATP-Binding Cassette, Subfamily A, Member 1 (ABCA1) as the gene responsible for Tangier disease [3–5]. These findings were immediately verified by other investigators [6–8]. It turned out to be a very tight finish to a 40-year race. Thus, slowly but surely, many of the phenotypes associated with lipid disorders have been assigned to specific genes; a search of the Online Mendelian Inheritance in Man website (http://www.ncbi.nlm.nih.gov/omim/) using the term 'lipid disorders' reveals that most of the 124 hits already have genes assigned and mutations identified, explaining some of the molecular bases for the clinical/biochemical phenotypes. These disorders tend to be rare, however, and they do not account for the most common dislipidaemias present in the general population. The truth is that it is not known how many genes and single nucleotide polymorphisms (SNPs) will be needed in order to classify people precisely according to their genetic predisposition to cardiovascular disease (CVD), but it is likely that one should gear up for a long and difficult race . At this time, most of the obvious 'candidate' genes have already been identified and characterised, including those coding for the known apolipoproteins, lipolytic enzymes, cellular receptors, lipid transporters and some transcription factors, although the picture provided is neither complete nor clear. Researchers need to identify many more new genes, and this endeavour is being accomplished using multiple approaches, ranging from bioinformatics to whole genome scans . More powerful tools are now needed to harness the complexity of the problem at hand. The necessary power will come from the more potent statistical and bioinformatics tools that are being developed, and by taking into consideration the significant contribution of scores of environmental factors to the phenotypes being considered. Diseases of the circulatory system, including CVD, are the major cause of morbidity and mortality in the world, and current trends indicate that this is not going to change in the near future. The good news is that CVD can be, and is, pre-vented . CVD risk is determined by a combination of modifiable and non-modifiable (including genetic) factors, therefore, the current thinking is that an accurate prediction of an individual's genetic predisposition will lead to those who are at higher risk being targetted more efficaciously. Thus, one of the most important outcomes from the search for the genetic factors involved in lipid metabolism will be an increased ability to identify early and accurately 'who is who' in CVD risk. It would be frustrating, however, if all that one could do was to 'label' people without providing proper guidance towards a healthier and longer CVD-free life. This is where the new areas of nutrigenetics, pharmacogenetics and other areas that could fall within the general term of 'envirogenetics' come into play. Many polymorphisms, at scores of gene loci, have been examined to uncover associations with lipid-related variables; however, very few have shown consistent results, and in many cases they do not provide independent information over that elicited from the currently used biochemical markers. If this is the case, has all this effort been a huge waste of time and resources? The answer is probably 'no'. One should keep in mind that the lifetime tracking of biochemical markers tends to be poor. 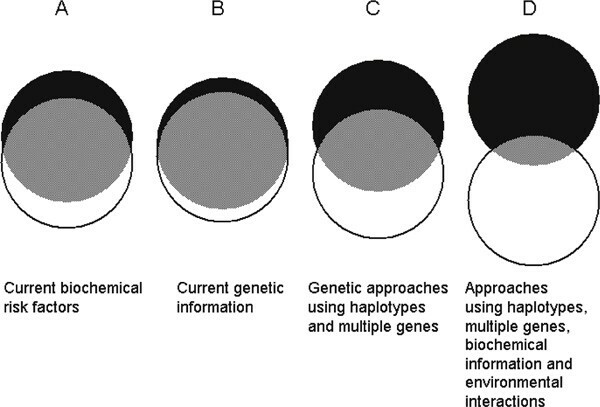 Therefore, genetic markers could still be used as early predictors, well before the phenotypes are expressed (see Figure 1). 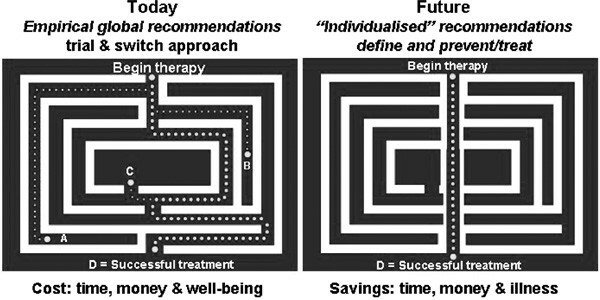 Moreover, they have the potential to guide the choice of effective preventive/therapeutic approaches (see Figure 2). 'Reducing the eclipse': The classical biochemical predictors of coronary heart disease still have a significant overlap (grey area) between cases (black circles) and controls (white circles). Current information based on isolated markers does not provide much better separation. The notion is that merging genetic, biochemical and behavioural information will provide the tools to get an early and close-to-complete separation between those individuals who could become 'cases' and those who will remain free of disease. Therapeutic effects of dietary, behavioural and pharmaceutical treatments can be predicted for the 'population', but when it comes to the individual, we are still limited to trial and error. The fields of pharmacogenetics and nutrigenetics aim to cut through the maze and provide more effective personalised recommendations. The gene that has provided most excitement by far to the genetic epidemiology of lipids is the APOE gene. The potential impact on public health of genetic variation at this locus may have even exceeded the wildest dreams of Utermann et al. when they reported for the first time common variants in the population in 1975 . Other genes are falling far behind in terms of consistency of the results being obtained and impact on the population at large. The reasons for the poor outcome or lack of consistency for this research are many and some of them have been recently analysed and discussed (see Table 1) [14–16]. It has been rigorously demonstrated that lowering serum lipid levels with pharmacological agents results in significant reductions in CVD events and total mortality in both primary and secondary prevention trials; however, the magnitude of plasma lipid responses to hypolipaemic drug therapies varies considerably among individuals . These differences may be due to the multiple genetic factors that affect pharmaco-kinetics (eg polymorphisms in the genes coding for drug metabolic enzymes) or pharmacodynamics (polymorphisms in drug target genes), as well as a myriad of modifiable factors that may account for as much of the variability as the genetic components themselves. Increasing knowledge of the network of genes that govern drug response should allow for the possibility of optimising drug therapy based on the individual's molecular diagnosis and response [19, 20]. There is much potential in the use of pharmacogenetics to improve the success of achieving individual target lipid levels, saving lives, time and money (see Figure 2). While current information is sufficiently enticing to prove the concept of the genetic basis of drug responses however, it does not provide a strong incentive for the pharmaceutical industry to adopt the concept, or for the clinician to use these tools in their daily practice. The initial studies addressing gene-lipid-lowering drug interactions date back to the late 1980s, although this concept did not generate much general attention until the report from the Regression Growth Evaluation Statin Study (REGRESS), related the cholesterol ester transfer protein gene (CETP) locus to differential changes in the progression of atherosclerosis following pravastatin therapy . The common CETP TaqIB polymorphism appeared to predict whether men with coronary artery disease (CAD) would benefit from treatment with pravastatin to delay the progression of coronary atherosclerosis independently of effects on plasma lipids. The puzzling finding was that the people who benefited less were those who carried the protective B2 allele . The solution to this paradox may be scattered through other reports demonstrating that the response of high-density lipoprotein (HDL)-C levels to atorvastatin treatment was associated with the TaqIB polymorphism in the direction that one would have predicted based on the REGRESS results [23, 24], and this was especially found to be true in diabetic subjects . Unsurprisingly, however, the locus that has been examined by a larger number of investigators is the APOE gene. Current pharmacogenetic knowledge is summarised in Table 2. Several of the large lipid-lowering trials and several smaller studies have been contributing with some limited, and frequently controversial, information; this is also happening in other areas of pharmacogenetics . 4S: Scandinavian Simvastatin Survival Study; CARE: Cholesterol and Recurrent Events; DALI: Diabetes Atorvastatin Lipid Interaction; ERA: Estrogen Replacement and Atherosclerosis trial; FATS: Familial Atherosclerosis Treatment Study; FH: Familial Hypercholesterolaemia; FHRT: Familial Hypercholesterolaemia Regression Trial; KORFPS: Kuo-pio Osteoporosis Risk Factor and Prevention Study; LCAS: Lipoprotein and Coronary Atherosclerosis Study; NMAPS: New Mexico Aging Process Study; PLAC1 Pravastatin Limitation of Atherosclerosis in Coronary Arteries Study-1; REGRESS: Regression Growth Evaluation Statin Study; WOSCOPS: West Of Scotland Coronary Prevention Study. ATORVA: atorvastatin; BEZA: bezafibrate; CHOLY: cholestyramine; COLEP: colestipol; FENO: fenofibrate; FLUVA: fluvastatin; GEMF: gemfibrozil; HRT: hormone replacement therapy; LOVA: lovastatin; NIA: niacin; PRAVA: pravastatin; PROB: probucol; SIMVA: simvastatin. ABCA1: ATP-binding cassette, subfamily A, member 1; ACE: angiotensin I-converting enzyme; APOB: apolipoprotein B; APOE: apolipoprotein E; APOA4: apolipoprotein A-IV; AT2R1: angiotensin II receptor, vascular type 1; B1AR: beta-1-adrenergic receptor; CD14: monocyte differentiation antigen CD14; CETP: cholesteryl ester transfer protein; CYP2D6: cytochrome P450, subfamily IID; ESR1: estrogen receptor 1; Factor XII: coagulation factor XII; FGA: fibrinogen, A alpha polypeptide; IL6: interleukin 6; LDLR: low-density lipoprotein receptor; LIPC: lipase, hepatic; LPL: lipoprotein lipase; MMP3: matrix metalloproteinase 3; PON1: paraoxonase 1; PPARA: peroxisome proliferator-activated receptor-alpha; PPARG: peroxisome proliferator-activated receptor-gamma; TNFA: tumour necrosis factor, alpha. As previously mentioned, the APOE locus has been the most studied locus in lipid pharmacogenetics. Common genetic variability at the APOE gene, as defined by the e2, e3 and e4 alleles, was initially associated with plasma lipoprotein levels, CVD risk and a long list of other non-lipid related traits, such as neurological disorders, eye diseases and cancer . Among all the many loci investigated in terms of variation in plasma lipid levels, the APOE locus has provided the most consistent associations for plasma LDL-C concentrations in the general population. Moreover, it appears that variation at the APOE gene may also be a significant indicator of response to both dietary and pharmacological interventions [20, 28–48]. Several studies have shown that, following statin therapy, male subjects carrying the APOE2 allele tend to have the greatest LDL-C decreases, whereas APOE4 carriers have the smallest. Based on those observations, one would be tempted to conclude that male APOE4 carriers might benefit the least from statins; however, when clinical events have been examined in relation to statin treatment and APOE genotype, the outcome was paradoxical . Data from the Scandinavian Simvastatin Survival Study (4S) showed that among myocardial infarction survivors, carriers of the APOE4 allele had a nearly twofold increased risk of dying compared with other patients; however, the good news was that the genetic predisposition towards excess mortality was abolished by statin treatment. This was true despite the fact that the effectiveness of simvastatin in reducing LDL-C levels in subjects with different APOE genotypes was not significantly different. Likewise, the Lipoprotein and Coronary Atherosclerosis Study (LCAS) showed that, in agreement with the emerging trend, subjects with the APOE4 allele had a smaller reduction in LDL-C levels with fluvastatin; however, they had similar benefit in terms of CAD progression/regression . Despite the slightly lower LDL-C response associated with the presence of APOE4, the increased genetic predisposition towards CVD risk present in carriers of this allele seems to be abolished following statin therapy. Why is the gene for a statin interaction observed for the LDL-C response in men not present in women? Are male APOE2 carriers likely to have a greater benefit, in terms of cardiovascular mortality and morbidity, than APOE4 or APOE3/3 subjects? This should be expected based on their significantly greater LDL-C reductions; however, this has not been addressed in previous studies, due to the small numbers of subjects involved. Which pleiotropic effect is responsible for the fact that APOE4 carriers are less responsive to statins in terms of LDL-C lowering, even though they get similar, or even greater, clinical benefit? It is interesting to highlight that the pattern of LDL-C responses, according to APOE genotype observed for statins in men, parallels that seen with hormone replacement therapy (HRT) in women. Statins, like HRT, upregulate the number of LDL receptors (LDLRs). Therefore, the APOE2 allele and statins may have additive effects and this may also be the case for HRT and APOE2. Conversely, the apoE4 isoform induces a decrease in LDL receptor numbers, which counteracts the statin-induced increase. For many years, investigators have considered the LDLR gene an obvious focus of interest to examine the impact of a monogenic disorder (familial hypercholesterolaemia [FH]) on biochemical, clinical and disease phenotypes. The number of mutations in the LDLR gene is growing continuously. Most of these are very rare and associated with the clinical manifestation of FH; however, some of these mutations are relatively common in the population, although there is no clear evidence that they play a major role in the population attributable risk for high cholesterol levels . The LDLR locus has also been an obvious target for the study of the pharmacogenetics of statin therapy. In general, these studies have examined different types of FH mutations in relation to LDL-C lowering by statins in FH heterozygotes [50–60]. The data presented in Table 2 show a balance between those who reported a modulating effect of the LDLR gene and those who did not find any significant interaction. The major caveats for most of these studies are the small sample sizes and the heterogeneity of the populations studied (Table 3). apoB: Apolipoprotein B; APOA1: apoliprotein AI; HDL: High-density lipoprotein cholesterol; LDL-C: low-density lipoprotein-C; TC: total cholesterol; TG: triglyceride. 4S: Scandinavian Simvastatin Survival Study; CARE: Cholesterol and Recurrent Events; DALI: Diabetes Atorvastatin Lipid Intervention; ERA: Estrogen Replacement and Atherosclerosis trial; FATS: Familial Atherosclerosis Treatment Study; HRT: hormone replacement therapy; KORFPS: Kuopio Osteoporosis Risk Factor and Prevention Study; LCAS: Lipoprotein and Coronary Atherosclerosis Study; NMAPS: New Mexico Aging Process Study; PLAC1: Pravastatin Limitation of Atherosclerosis in Coronary Arteries Study-1; REGRESS: Regression Growth Evaluation Statin Study; WOSCOPS: West Of Scotland Coronary Prevention Study. ATORVA: atorvastatin; BEZA: bezafibrate; CHOLY: cholestyramine; COLEP: colestipol; FENO: fenofibrate; FLUVA: fluvastatin; GEMF: gemfibrozil; LOVA: lovastatin; NIA: niacin; PRAVA: pravastatin; PROB: probucol; SIMVA: simvastatin. ABCA1: atp-binding cassette, subfamily a, member 1; ACE: Angiotensin I-converting enzyme; APOB: Apolipoprotein B; APOE: Apolipoprotein E; APOA4: Apolipoprotein A-IV; AT2R1: Angiotensin II receptor, vascular type 1; B1AR: Beta-1-adrenergic receptor; CD14: Monocyte differentiation antigen CD14; CETP: Cholesteryl ester transfer protein; CYP2D6: Cytochrome P450, subfamily IID; ESR1: Estrogen receptor 1; Factor XII: Coagulation factor XII; FGA: Fibrinogen, A alpha polypeptide; GP3A: Platelet-specific antigen system PL(A1); IL6: Interleukin 6; LDLR: Low-density lipoprotein receptor; LIPC: Lipase, hepatic; LPL: Lipoprotein lipase; MMP3: Matrix metalloproteinase 3; PON1: Paraoxonase 1; PPARA: Peroxisome proliferator-activated receptor-alpha; PPARG: Peroxisome proliferator-activated receptor-gamma; TNFA: Tumour necrosis factor, alpha. *borderline significance (p ≈ 0.05); **the phenotype reported is low-density lipoprotein-C/high-density lipoprotein-C. The CETP gene and the product of its expression are emerging as important players in the future of risk assessment, pharmacogenetics and new drug targets. The association between common variants and HDL-C concentrations is physiologically relevant and fairly consistent among populations . The consistency of the associations between CETP polymorphisms and HDL-C levels can be compared with those observed for the APOE gene in relation to LDL-C levels. The same cannot be said, however, about its association with CVD risk , which remains controversial. With regard to the interaction between common variants and drug treatment, there is growing evidence for a significant role for the CETP locus in determining the efficacy of statin therapy [21, 23–25]. The hepatic lipase (LIPC) gene: Protective or not? Hepatic lipase (HL) is a plasma lipolytic enzyme that participates in the metabolism of intermediate-density lipoprotein and large LDL into smaller, denser LDL particles, and in the conversion of HDL2 to HDL3 during reverse cholesterol transport. It has also been suggested that HL acts as a ligand for cell-surface proteoglycans in the uptake of lipoproteins by cell-surface receptors. HL deficiency is characterised by mildly elevated concentrations of triglyceride-rich LDL and HDL particles, as well as impaired metabolism of postprandial triglyceride-rich lipoproteins, which may result in premature atherosclerosis. Conversely, increased HL activity has been associated with increased small, dense LDL particles and decreased HDL2 concentrations, which may also result in increased CAD risk. Four common SNPs on the 5'-flanking region of the HL gene (LIPC) [-763(A/G); -710(T/C); -514(C/T) and -250(G/A)] appear to be in total linkage disequilibrium and define a unique haplotype which has been associated with variation in HL activity and HDL-C levels . The less common A allele of the SNP at position -250 was associated with lower HL activity and buoyant LDL particles. Normal and CAD subjects heterozygous for the A allele had lower HL activity and significantly more buoyant LDL particles. Homozygosity for this allele (AA) was associated with an even lower HL activity. The A allele was associated with higher HDL2-C . Given the wide spectrum of effects that HL exerts on lipoprotein metabolism, and the significance of the promoter variant(s), it is reasonable to hypothesise that genetic variation at this locus may also be involved in variability in the response to hypocholesterolaemic treatment. This notion was recently explored by Zambon et al. in the Familial Atherosclerosis Treatment Study (FATS) trial . Following intensive lipid-lowering therapy, subjects with the CC genotype at the -514(C/T) polymorphism, which is equivalent to the A allele previously described above for the -250(G/A) polymorphism, had a greater decrease in HL activity compared with carriers of the T allele. Consistent with this effect on HL, these subjects also experienced a greater improvement in their LDL-subclass distribution, as well as increases in HDL2-C concentrations. In addition to the greater improvement in their lipid profile, CC subjects also demonstrated the greatest coronary stenosis regression, as determined by quantitative angiography. This is the first report of a pharmacogenetic interaction for the LIPC locus and, although promising, needs replication by other investigators. Other lipid genes (ABCA 1 , APOA4 , APOB [31, 67], ERA , LPL [42, 69, 70], and PPARA[42, 71]) and PON1 [72, 73], despite their interest as candidate genes for lipid disorders and the number of publications showing different degrees of associations, have been less studied and it is too soon to make a verdict about their contribution to the individual variability in response. Some of these genes are beginning to emerge as serious players, especially when it comes to therapies involving fibric acid derivatives. In this case, it comes as little surprise that the PPARA gene is already showing significant effects [42, 71]. There are, however, some notorious absences, such asthe 3-hydroxy-3-methyl-glutaryl coenzyme A (HMG-CoA) reductase (HMGCR) gene, for which no data have been yet reported . Considering the multifactorial nature of CVD and the potential pleiotropic effects of the statins, other genes related mainly to hypertension, coagulation, inflammation, vascular structure and drug metabolism have been examined. Again, the outcome has been mixed and based on too few studies and subjects (see Table 2) [68, 75–85]. Nutrigenomics and nutrigenetics are emerging as promising multidisciplinary systems that focus on studying the interactions between nutrition, genetic factors and health outcomes, using similar technical and conceptual developments to those described for pharmacogenomics and pharmacogenetics. The terms 'nutrigenomics' and 'nutrigenetics' have largely been used interchangeably;[86–89] however, there are significant conceptual differences in their approaches and aims. Nutrigenomics applies to the comprehensive, genome-wide assessment of the effects of dietary factors or interventions, and is concerned with the systematic assessment of how nutrients modify the overall expression pattern in cells and tissues of interest. By contrast with nutrigenetics, nutrigenomics does not focus on interindividual differences with regard to the effects of nutrients, but rather focuses on differences among several dietary conditions or factors in quantitative measures of expression and their association with specific phenotype characteristics. Nutrigenetics, however, describes the interactions between nutrients (or dietary habits) and the characteristics of individuals, which, to some extent, will be determined by their genetic makeup. Thus, nutrigenetics is based on observations of dietary responses in individuals and tests the hypothesis that interindividual differences in the observed response may be associated with the presence or absence of individual-specific biological markers, in most cases SNPs, which may allow prediction of individual dietary responses [27, 90, 91]. Although nutrigenetics and nutrigenomics share many of the concepts of pharmacogenetics and pharmacogenomics, there also important differences: 1) the latter apply to the segment of the population needing drug therapy, whereas the former apply to everyone; and 2) in general, the magnitude of the differences resulting from nutritional effects is much smaller than that expected from pharmacological agents, making the characterisation of interactions more difficult. Nutrigenetics is moving forward through similar convoluted paths as those described for pharmacogenetics [27, 91]. The findings of this author's group, using well-characterised population studies[92–95] as well as dietary intervention trials [96–98], support statistically significant interactions between several candidate genes, plasma lipid concentrations and dietary factors. Individuals who respond better to one type of recommendation than to another can now begin to be characterised. For example, a low fat, low cholesterol strategy may be especially beneficial in terms of lowering plasma cholesterol levels in those subjects carrying the APOE4 allele at the APOE gene . This also applies to other CVD risk factors, such as HDL concentrations. The levels of HDL are also modulated by dietary, behavioural and genetic factors. It has recently been reported that the effect of dietary intake of polyunsaturated fatty acids (PUFAs) on HDL-cholesterol concentrations is modulated by a common genetic polymorphism in the promoter region of the APOA1 gene. Thus, subjects carrying the A allele at the -75 G/A polymorphism show an increase in HDL-C concentrations with increased intakes of PUFAs, whereas those homozygotes for the more common G allele show the expected lowering of HDL-C levels as the intake of PUFAs goes up . Most interestingly, significant interactions have also been reported between the intake of fat, specifically of animal origin, and variability at the HL gene . These data could identify a segment of the population especially susceptible to diet-induced atherosclerosis. Moreover, these data could shed some light on the impaired ability of certain ethnic groups to adapt to new nutritional environments, as is clearly seen for Native Americans and Asian Indians . This knowledge should pave the way for more successful dietary recommendations based on genetic factors; this may help to reduce CVD risk more efficiently than the current universal recommendations. The same concept is clearly applicable to other age-related disorders. The data presented here suggest that at some time in the future it will be possible to make preventive recommendations and medical decisions based on an individual's specific genetic makeup; however, this is a process that will slowly permeate into clinical practice and public health systems. Before this occurs, there is much that needs to be done . First, the level of consistency among scientific reports needs to be increased before researchers can move to issues of sensitivity and specificity, as has traditionally been the case for other non-genetic assays. It should also be emphasised that most of the findings have been reported primarily in white males, and there is evidence that males and females respond differently to intervention, and that the same genetic determinants may not translate equally into phenotypes. Moreover, it is known that different ethnic groups have different haplotypes, and that the findings reported for white populations do not necessarily apply to other ethnic groups, underscoring the need for comprehensive examination of these questions in different ethnic groups and geographical areas. Once researchers have solid evidence about the predictive value of genetic panels, they can start generating risk and therapeutic algorithms that should provide the measure of genetic predisposition, as well as targeted behavioural modifications or drugs of choice and also personalised dosages. Finally, there is a need to put these developments to the test in 'real life'. The feasibility and success of this concept will need to be demonstrated using clinical trials comparing standard care versus approaches using genetic information. Replication of findings is important, both internally within a report and also by other researchers. Therefore, such reports are also important to the field; however, in order to avoid cluttering the current literature, confirmatory studies should also provide some novel information beyond mere replication. Supported by NIH/NHLBI grant no. HL54776, NIH/NHLBI contract no. 1-38038 and contracts 53-K06-5-10 and 58-1950-9-001 from the US Department of Agriculture Research Service, the author would like to express his deepest gratitude to the late Richard H. Ward, who was a continual source of learning and inspiration during the initial stages of the author's genetic research -- he feels very privileged to have had him as collaborator and friend.